How well did you find your way around 1955 Chicago? We are at Belmont and Wilton, a short-block east of Sheffield. The &apos;L&apos; station is one clue to the location. The platform canopies indicate that there are four tracks running through the station, which tells us we&apos;re somewhere on the North Side main line. Notice the building behind the turning bus. In the contemporary photo, that building has been torn down because of renovations at the station. The double overhead wires reveal that we are on a street with trolley buses, and one of them can be seen in the distance. The gasoline bus turning onto Belmont is on a short extension route that ran between the &apos;L&apos; station and Lake Shore Drive. 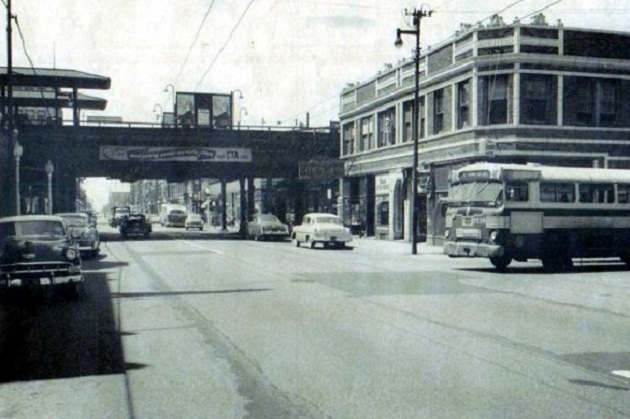 Like the streetcars that preceded them, the Belmont trolley buses went only as far east as Halsted. In 1955 this neighborhood was simply known as East Lakeview. Today&apos;s it&apos;s called Wrigleyville. The name change hasn&apos;t seemed to have helped the Cubs.